The Settlement of Varendra, spoken as Janakabhu (fatherland) was one of the most flourishing territories of ancient Indian sub-continent. We come to know from different literary and epigraphic evidences that a separate school of artisans earned wide reputation here at the reign of Pala dynasty and the streams of art making were uninterrupted until the Sena dynasty. Some of the leading and enlightened citizens of Rajshahi felt the necessity and justification of establishing such an institution that would explore the precious past of this region. Henceforth, ‘The Varendra Research Society’ was established in 1910, and the founder of the Society Kumar Sarat Kumar Ray, the scion of Dighapatiya Royal family accompanied by Aksaya Kumar Maitreya, a leading lawyer and renowned historian; Ramaprasad Chanda, a reputed scholar in history, art and archaeology and others explored a good number of archaeological and historical artifacts excavating in some villages of Rajshahi. Then, the conviction grew in Kumar’s mind if a centre of archeological research was to be established at Rajshahi, the finds should be preserved there as the nucleus of a local museum. Accordingly, in order to collect, preserve, study and research the history and culture of ancient and medieval Bangal in general and of Varendra region in particular, three worthy sons of the soil mentioned above took the noble effort to establish a museum. Thus, the Varendra Research Society and Museum was set up at Rajshahi in 1910. In fact, it is not only the premier institution of its kind, but also the splendid accomplishment of its organisation in Bangladesh. The role of the society concerning the museum was that of proprietor and caretaker. However, this was formally inaugurated on 27 September 1910 and was registered in 1914 in accordance with the Indian Society Act-1860. The Varendra Research Museum was founded with a standing tribute to the princely generosity of Kumar Sarat Kumar Ray as mentioned above as a president; the great scholarship of Aksaya Kumar Maitreya as a Director; Ramaprasad Chanda, as an honorary Secretary. 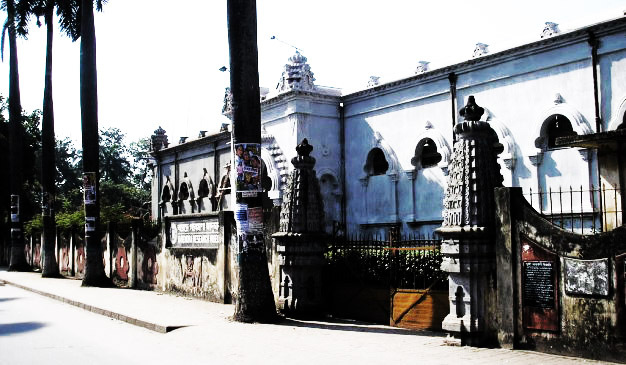 The existence of the museum was seriously threatened in the year of 1911 when the Indian Museum Calcutta demanded all rare and unique specimens collected by the Varendra Research Museum. The catastrophe was averted through the sympathetic attitude of J. A. Monahan, the then Commissioner of Rajshahi division. The then Governor of Bengal Lord Carmichael visited the museum in 1912 and was highly impressed by the museum’s collection of sculptures and other archaeological relics. Soon after this, the Governor of Bengal in 1913 guaranteed perfect freedom to the promoters of local museums in matters of collection, preservation and display of ancient artworks. In order to collect sculptures, epigraphs, manuscripts, coins and other objects of antiquarian value, the Kumar and his associates organised a number of exploratory tours to numerous sites in the districts of Rajshahi, Bogra, Rangpur, Dhaka, Maldah, 24 Parganas etc. In addition, these tours proved extremely rewarding and an encouraging number of relics were discovered, identified and collected. The society organised the excavations at Deopara, Palpara, Malanca, Jugpur, Itahar, Chabbisnagar, Mandoil, Khetur, Kumarpur, Vijaynagar, Cossipur, Mahisantosh, Paharpur etc. All the costs of exploratory tours had been borne by the Kumar. The museum collections, as well as books and manuscripts acquired by the society, were housed in two rooms of the Public Library until the museum building was erected. In 1916, the nearly two-acre site at the heart centre of the town was generous gift for museum made by Kumar’s elder brother. Lord Carmichael laid the foundation designed by the Kumar himself on 13 Nov. 1916. The entire cost of construction was borne by the Kumar. He, fully furnished, made over the building to the society for housing the collections. Thus, Lord Ronaldshay, the then Governor of Bengal and a reputed Indologist., declared the museum open to all. The museum was, almost from its inception, under the Council of Management of the society. In 1937, the museum including the building and the premises, the entire collection of exhibits, the library, the furniture and other properties of the society were brought under the operation of the Government of Bengal Education Department in accordance with the Charitable Endowment Act- 1880 and then, the museum was to be administered by a Committee of Management. The Varendra Research Museum thus relieved of its onerous responsibilities. A severe blow, which hit the museum to jeopardise its existence, was the partition in August 1947. Apart from this, some deaths (as for example: A.K. Maitreya died in 1930 and Kumar Sarat Kumar Ray died in 1945) and some departure (from the then East Pakistan to India) of organisers as well as well wishers of the museum increased the jeopardy. For about nineteen years since the partition, the museum passed through what may be rightly described as a near moribund stage. Having anticipated the intentions of the central and provincial governments, Prof. A.R. Mallick, the honourary Curator had taken a courageous as well as the most prudent step to save the museum for the people of Rajshahi. He first convinced the Rajshahi University authorities of the imperative necessity for taking over the museum in the interest of research. He also succeeded in persuading the Museum Management Committee to accept his proposal of transferring the museum to the university. Then, in a simple ceremony on 10 th October 1964, the deed of transfer was signed by Mr. M Jamilur Rahman, CSP, the Chairman of the Committee on behalf of the Government, and Dr. A.R. Mallick, Professor of the history department of the university and Curator of the museum, duly authorized by the university for this purpose. Moreover, the Varendra Research Museum would henceforth be treated as an integral part of the Rajshahi University. The university syndicate constituted an Advisory Committee for the museum, consisting 14 members. The Vice Chancellor is the Chairman ex-officio and the Director of the museum is the Member-Secretary of the Committee. The Varendra Research Society is now defunct, but the Varendra Research Museum service as the standing tribute to their good deeds for the preservation of our cultural heritage and promotion of learning. It has been playing dominatingroles in collecting the artifacts from every nook and corner of the country till now. All rights reserved © ICT Center, Unversity of Rajshahi 2016.